Success! Alex from Kenya raised $619 to fund corrective surgery. Alex's treatment was fully funded on February 20, 2019. Alex had a successful surgery to close the colostomy. “I would like to thank your foundation for your very generous gift. We really do appreciate it. Thank you again,” says Alex’s mother. Alex is a baby from Kenya. Alex lives with his two siblings and parents in the Eastern region of Kenya. Alex underwent a colostomy, in which the end of the colon is brought through an opening in the abdominal wall. This surgery is often performed to bypass bowel malformations, but colostomies are usually temporary and may call for closure. In Alex’s case, his colostomy requires closure in order to restore bowel function and prevent future complications. Our medical partner, African Mission Healthcare Foundation, is requesting $619 to cover the cost of a colostomy closure for Alex. The surgery is scheduled to take place on February 1 and, once completed, will hopefully allow him to live more comfortably and confidently. “Please help us once again and we will appreciate,” says Alex’s mother. Alex's case was submitted by Joan Kadagaya at African Mission Healthcare Foundation in Kenya. Alex was submitted by Joan Kadagaya, Curative Medical Support Program-Partner Representative at African Mission Healthcare Foundation, our medical partner in Kenya. Alex received treatment at BethanyKids Kijabe Hospital (BKKH). Medical partners often provide care to patients accepted by Watsi before those patients are fully funded, operating under the guarantee that the cost of care will be paid for by donors. Alex's profile was published to start raising funds. Alex's treatment was fully funded. Alex's treatment was successful. Read the update. Chanthoeun is a 48-year-old rice farmer from Cambodia. In her free time, she likes to watch both Khmer and Thai dramas on the television. Twenty years ago, Chanthoeun developed a pterygium in both eyes, causing her irritation, burning, and blurry vision. Pterygiums are non-cancerous growths of the conjunctiva, a mucous layer that lubricates the eye. The growths occur when the conjunctiva is exposed to excessive sun damage and the cells grow abnormally over the pupil. She has difficulty seeing things clearly, recognizing faces, working, and going anywhere outside. 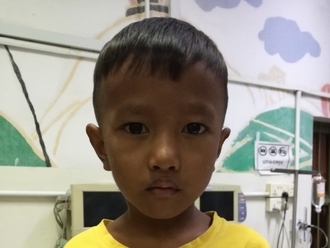 When Chanthoeun learned about our medical partner, Children's Surgical Centre, she traveled for four and a half hours seeking treatment. Chanthoeun needs a surgical procedure to remove the abnormal conjunctiva from the cornea surface and replace it with a conjunctival graft to prevent recurrence. The total cost of her procedure is $201. This covers medications, supplies, and inpatient care for two days. The procedure is scheduled for March 5. She says, "I hope that after my surgery, the irritation will stop so I can see again and go back to my rice farming." Meng is a boy from Cambodia. He is six years old and has just begun first grade. He would like to be a police officer when he grows up. Three years ago, Meng received a medical injection to his left thigh and two months later, he was not able to walk normally. Meng has come to our medical partner in hopes that surgery will help correct his upper thigh and allow him to walk normally again. Surgery is scheduled for March 5 and will cost $417.